When you pet has an injury or illness, we will help them get back on their feet (or should that be paws?!) again. Rehabilitation and physiotherapy encompasses a range of treatments and therapies designed to get your pet up and running as soon as possible according to their needs and condition. Rehabilitation is a new and emerging field in Veterinary Medicine, although it has been used for many years in the medical field to help us after illness or injury. Most people at some point will have seen a physiotherapist or other professional but it seems that in the veterinary world we are still catching up with our human contemporaries. An individual rehabilitation program will be tailored to your pet and their specific condition and will take into account concurrent problems they may have. We encourage all owners to be as involved as possible in their pet’s treatment and where possible we will advise you on a home exercise program so that your pet’s progress can be maintained between visits to the clinic. Most dogs and cats really enjoy their physiotherapy sessions both at home and in the clinic and they will often relax and fall asleep during their treatments. 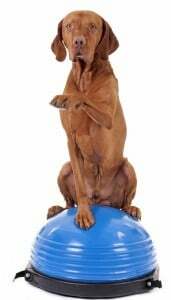 Rehabilitation may involve physiotherapy exercises to help improve joint mobility, build muscle and improve core stability (pilates for dog and cats). Many of the exercises that we do in the clinic can be continued at home and as your pet improves we increase the difficulty of the exercises or add new ones. At Active Pet we have a range of equipment to help your pet get back to fitness ranging from Swiss balls, through to therabands, and a state of the art underwater treadmill for your dog, cat or rabbit to use. As your pet may be on restricted exercise for a certain period, for example after a surgery, then learning new exercises as part of a controlled rehabilitation program is an excellent way of keeping them mentally stimulated until they are back to their usual activity levels. 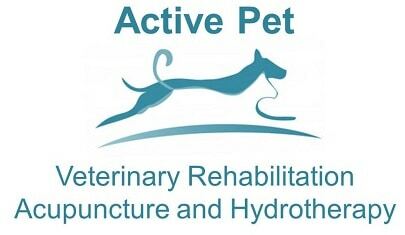 For your pet to benefit most from rehabilitation and physiotherapy we do need to ensure that they are as pain-free as possible and that is where we can use acupuncture, medication and other methods to ensure that your pet enjoys their sessions and continues to improve. All pets progress at different rates and so it is important to have constant assessment to ensure that improvement is continual and steady so as to allow their body to heal, adapt and to prevent re-injury. Regular reassessment enables the quickest return to function for your dog or cat but we appreciate that sometimes this is not possible so we would advise a gentler program, which may take a little longer, but will ensure that the chance of re-injury is minimised. Rehabilitation and physiotherapy patients are looked after by our fully qualified team consisting of a Veterinary Surgeon and qualified ACPAT Veterinary Physiotherapist. There are many veterinary physiotherapy qualifications available and the training is quite variable. An ACPAT physiotherapist is a chartered physiotherapist i.e. a human physiotherapist who has then gone onto do further training in veterinary physiotherapy. The combination of a Veterinary Surgeon and ACPAT Veterinary Physiotherapist working together ensures that your pet receives the best possible care at the clinic.